In the field of particle physics, the word “workshop” has a rather broad usage; some workshops are just conferences with a little bit of time for discussion or some other additional feature. But some workshops are about WORK…. typically morning-til-night work. This includes the one I just attended at the Perimeter Institute (PI) in Waterloo, Canada, which brought particle experimentalists from the CMS experiment (one of the two general-purpose experiments at the Large Hadron Collider [LHC] — the other being ATLAS) together with some particle theorists like myself. In fact, it was one of the most productive workshops I’ve ever participated in. The workshop was organized by the PI’s young theoretical particle physics professors, Philip Schuster and Natalia Toro, along with CMS’s current spokesman Joseph Incandela and physics coordinator Greg Landsberg. (Incandela, professor at the University of California at Santa Barbara, is now famous for giving CMS’s talk July 4th announcing the observation of a Higgs-like particle; ATLAS’s talk was given by Fabiola Gianotti. Landsberg is a senior professor at Brown University.) Other participants included many of the current “conveners” from CMS — typically very experienced and skilled people who’ve been selected to help supervise segments of the research program — and a couple of dozen LHC theorists, mostly under the age of 40, who are experienced in communicating with LHC experimenters about their measurements. The stated aim of the workshop was to try to help the CMS experiment define and sharpen the goals of its research program for the coming year or two. Obviously a group of forty to fifty people can’t hope to represent the thousands of CMS experimenters and hundreds of particle theorists that one can find around the world — so the outcome of such a workshop can only be a set of tentative suggestions for the full CMS experiment to consider in its planning. But this combination of people seemed especially well-suited for an efficient exchange of sophisticated ideas. I’m sure I’m not alone among the workshop participants in feeling that I learned a great deal from the other attendees’ individual and collective wisdom and knowledge. I also thought that the workshop was very well-organized — with a small number of talks to lay important topics out on the table, followed by discussion sessions that split the participants into smaller focus groups. The atmosphere was intense: informal discussion continued even over lunch and coffee breaks, and often was heard at breakfast and dinner too. and there’s a fifth topic that underlies them all: triggering. I’ll describe the first four of these now, and hold the last for a later post. The main topics for the LHC Search Strategies workshop at the Perimeter Institute. 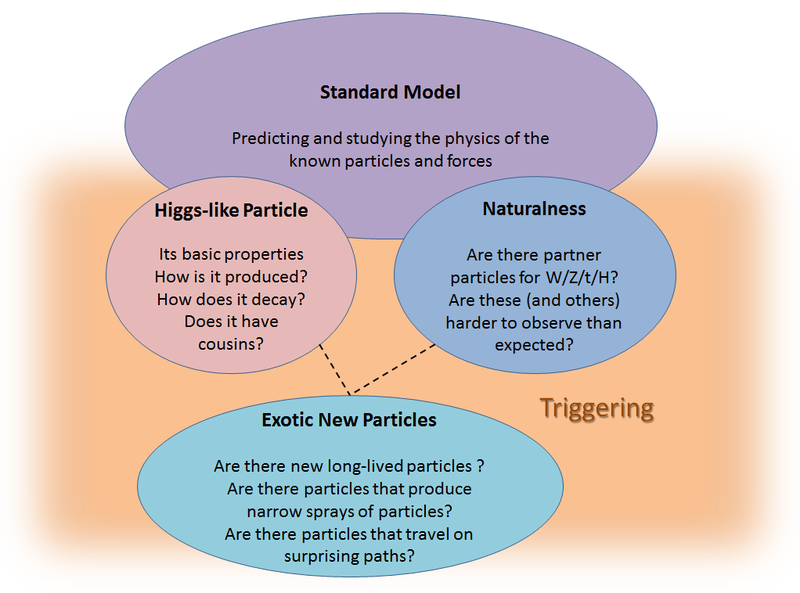 The two main thrusts of discussion were the Higgs-like particle and the partner particles expected in theories that try to resolve the “naturalness” puzzle. Standard Model predictions and measurements are needed for almost any discovery at the LHC. Weird signals from exotic new particles could cause various experimental challenges, and possibly could impact studies of the Higgs or searches for partner particles. Underlying all of these topics is the issue of triggering. The Higgs-Like Particle: obviously, everything about this particle needs to be studied. Precision measurements of how it is produced and how it decays are needed… including both production and decay modes that are expected for the simplest type of Higgs and most other types and (as I’ve discussed on this website) exotic modes of production and decay that are not expected for the simplest Higgs (and many other types.) And we also need to look for cousins that this particle might have: additional Higgs-like particles that might be harder to find than this first one. Naturalness-inspired particles: “Naturalness”, and the related “hierarchy problem”, deserve long explanations which I can’t give here, so here’s the short and unsatisfying explanation of what this means. We’ve just discovered what appears likely to be a Higgs particle, a particle of spin zero and a mass of 125 GeV/c2; (which means its mass-energy E = m c2, or “rest-energy”, is 125 GeV.) Everything we know about spin-zero particles from theory and past experiments tells us that a particle of this type should most “naturally” — meaning “generically” — be accompanied by additional new particles that we haven’t yet found. More specifically, for the known particles whose large mass is due, entirely or partly, to the particle’s fairly strong interaction with the Higgs field — the W, the Z, the top, and the Higgs itself (shorthand to be used below: W/Z/t/H)— there may well be “partner” particles, light enough to be accessible at the LHC. These partners are affected by the known forces in similar ways; for example, just as the top quark has electric charge that is 2/3 the charge of the proton, and is affected by the strong nuclear force, the same would be true of its partner. However, the known particles and their partners may have different spin. [For example, the partner of the top quark or of the Higgs would probably be spin-1/2 or spin-0; the partners of the W and Z would probably be spin-1/2 or spin-1.] There might be partners for other particles too, but possibly not accessible at the LHC. If the known particles have the right types of partners, then it becomes generic (i.e. natural) for the value of the Higgs field to be small but not zero, and for the mass of the Higgs particle to be small, relative to other even higher energy scales, such as the scale at which gravity’s effects on an elementary particle become strong — a thousand million million bigger than the mass-energy of the Higgs. Well, this is a long story, but the point is that if naturalness is a good guide — and it may not be — then we generally expect to find partner particles at the LHC of some type, at least for the heaviest known particles. Actually finding them can be pretty hard, however. The best known theory with partner particles is supersymmetry, but extra dimensional theories, composite-Higgs theories, little-Higgs theories, and others have them also. (In the extra-dimensional case they are called “Kaluza-Klein partner particles”.) So experimentally, if you want to try to know whether naturalness is a feature of nature, you want to look for, and either find or exclude, the various types of W/Z/t/H partners. Maybe you’d look for other particles’ partners, but there’s no requirement that they be accessible at the LHC. And that’s important. If the partners of the up and down quarks, and of the gluons (shorthand: u/d/g), exist and aren’t very heavy, they would be easy to produce in proton-proton collisions — because the protons contain up and down quarks (and anti-quarks) and gluons in abundance. Conversely, because the heavy W/Z/t/H are essentially absent from the proton, their partners are not so easily made in proton-proton collisions. And therefore all the searches for supersymmetry, and for similar theories, that have been carried out so far at the LHC are sensitive more to the u/d/g partners than to the partners of the W/Z/t/H. The fact that they’ve turned up nothing only tells us that the u/d/g partners, if they exist, are too heavy to make abundantly at the LHC right now; the W/Z/t/H partners might still be waiting for us to find. The problem is that the W/Z/t/H partner particles have low production rates, smaller than the rates for other ordinary processes that mimic them. On top of that, there are many different scenarios for how they might decay, and we don’t know what their masses are — so we have to look for them in many different ways… dozens, in fact. Standard Model backgrounds: for almost any signal of a new phenomena that might show up at the LHC, including production of the Higgs and production of W/Z/t/H partner particles, there are processes in proton-proton collisions involving known particles and forces that will look very, very similar, and often are much more common. The problem of finding a new phenomenon at the LHC is therefore typically unlike looking for a needle in a haystack; rather, it’s like looking for some aluminum needles in a haystack full of tin needles. This isn’t easy, unless you really know what tin looks like and what aluminum looks like and can find ways to tell the difference. And since the tin is so prevalent, you need to understand it very, very well; the better you understand it, the more likely you are to recognize a needle that isn’t made from tin. So most discoveries we can imagine making with the 2012 data require high-precision calculations, as well as cross-checks of those calculations in real data. Exotic new particles: When a proton-proton collision occurs at the center of the CMS detector, the particles that come flying out from the collision pass through the detector’s many electronic sensors, leaving electronic signals. These signals are then stored on computer, and converted, using software, into the best possible guess as to where the particles went and what they might have been; this process is called “reconstruction”. But some types of new particles that might be present in nature could look so weird that the software for reconstruction that the experimenters have written might partly or completely fail. However, as long as the experimenters have thought carefully about these weird particles, they can write specialized software to look in their data for signs that they might be present. Up to now there’s been limited manpower devoted to these possibilities, which made sense, because there were other things that would be easier to do and seemed less of a long-shot. But with the first phase of the LHC coming to an end, it’s important to start bringing these possibilities up a little higher on the priority list. This is especially so since exotic new particles, unrecognized in the data, could possibly have caused the searches even for the more common signals of naturalness, such as the u/d/g partners, to have failed so far. So searching for them is important in making sure that a striking new phenomenon hasn’t escaped notice. Triggering: I’ll tell you more about this later in the week. There’s quite an interesting story here, in which I’ve had some level of involvement during the first six months of the year. This entry was posted in Higgs, LHC Background Info, LHC News and tagged cms, ExoticDecays, LHC, searches, supersymmetry, top_quarks. Bookmark the permalink. You won’t find anything important there. Those are the plenary talks that got discussion rolling, and they just contain what everybody already knows; the discussions themselves are what were most valuable, and they aren’t summarized and posted. Moreover, with over 20 non-CMS members present, nothing that CMS might be especially concerned to hide from its competitors was covered even in the public discussions. In any case, the CMS collaboration as a whole hasn’t decided anything yet, so that’s the main reason why it is not appropriate to discuss these preliminary ideas; they are not representative of CMS as a collaboration. Thanks for the update…..look forward to the explanation on Triggering. Good morning Professor, I hope you enjoyed your stay here in the best country in the world and my home, Canada. Too bad I didn’t know in would be in Waterloo or else I would have loved to come over and say hello, I just live down the road in Toronto. Thank you the update on the workshop, again using a language which we novices can understand and appreciate the complexity and hence the brilliancy of our universe. I truly believe that complexity and brilliancy are synonymous, but that’s another subject for another post, hopefully. An observation which has puzzled me for many months, since I got interested in physics again (the LHC is what got me hooked again, :-)), theoretical physicists like yourself are very good in compartmentalized thinking and you in particular have found the secret on how to present your ideas using power point. Having said that, what I have noticed is the avoidance (deliberate or not?) of nesting the ideas (theories) so as not presume or imply a broader unification theory. Correct me if I am wrong, but isn’t that the end goal, unification? Or has it been abandoned? I was reading through you section on the hierarchy problem when I saw that number, 10,000,000,000,000,000, my thoughts went back to the Great Red Spot on Jupiter, again. I mentioned this possible analogy in a previous remark. This trapped storm was created (most likely) by the friction between the layers of the rotating gases. Vortices develop until a great mass of vortices reach a full 360 deg. rotation and hence get trapped between the transversing layers. If this analog in used for fundamental particles, could one say that trapped storm is the Planck’s particle (the smallest black hole) and the small transient vortices are the W, Z, t, and H particles (vortices which begin the process and will dissipate quickly (unstable vacuum) and some could reach 360 deg rotation but at extremely smaller “masses” (W, Z, t, H) than the main storm (Mp). As a lay person analogies do really help if they are framed properly. For example dimensional references Dr. Strassler helped to expand my perspective on. I would also say that given the perspective of the LHC it was not commonly understood by the lay public how cosmic article collisions were actually being framed within the experimental evidence of the LHC. I would point out then that the naturalness of our examinations while being framed within the LHC is also an examination of the cosmos as well as a basis of cosmological processes with regard to Star Formation. Dr Strassler can correct me if I am wrong in this assessment. I do offer this link as an example. If one looks at the cosmos they must include the basis of their research in LHC to encompass the very basics of particle manifestation in the cosmos? Unification hasn’t been abandoned, but we have to figure out directly from experiment what’s going on at the energy scales around 1 TeV (which is what the LHC can tell us) before we can try to infer by cleverness what’s going on at energy scales of 10,000,000,000,000 TeV (which is where unification is typically assumed to occur.) If we don’t wait for the LHC data to come in and be interpreted properly, we’re likely to get the wrong answer when we try to extrapolate to such huge energy scales that we can’t probe so directly. For example, many modern ideas about unification assume that supersymmetry is present at the TeV scale; but we’ve seen no sign of this as yet. I’m afraid I think your analogy with Jupiter’s storms is probably not useful for fundamental particles. Remember we have equations for fundamental particles that work extremely well, and these imply that fundamental particles are ripples in fields. [For example, the fact that an electron is a ripple in an electron field explains why all electrons are identical; an approach such as yours doesn’t address this crucial issue.] You have to explain the fields, and your analogy isn’t going to be able to do that. Do you have a link(s) that gives the characterization of a field? From your previous replies and posts, every particle has it’s own field and is characterized as a ripple, open for bosons and closed for fermions. I also read that physicist believe that although the masses of different particles are different, the volume is most likely identical is size, i.e. same spherical radius. Does the speed limit of EMR, c, have any thing to do with the volume being the same? If I can follow up the mentioned analog with a question, we today can see, measure, deduce the particles as ripples, propagation of observables in an infinite arrays of fields permeating the entire universe. If I understand right these particle are still lumps of spherical ripples trapped (closed, standing, joint string, etc) between various fields. The mentioned analog could still have happened, possibly during the inflation period before the universe became oscillatory in nature. In other words the analog could have been the mechanism that created the disturbances (ripples) but not necessarily the fields. PS: If I can add, the friction in the mentioned analog could be refraction. If refraction occur instantaneously to the release of energy at the Big Bang, the that could explain cooling and coalescing occurring right from the start, t=0. And these change of parameters could have caused the initial vortices and further coalescing of energy. OK: time to vent out more. It is very disappointing that Nature, a once serious journal, now obviously promotes him. My and Dude s comments are NOT off topic. By such lies as promoted in the Nature article, Mr. Gossip blatantly torpeds the efforts taken by serious physicists (for example in the workshop nicely reported about by Prof. Strassler in this post) to find or exlude new physics in accordance with the principles of science instead of wishful (or better hateful in the case of Mr. Gossip …?) thinking. My only involvement here was to contribute a link to slides which I think readers of this posting might find useful, since Matt had not included it. Up to Matt to decide whether anonymous character assassination that has nothing to do with the topic of his posting is what he wants to host on his blog. Dear Peter, first of all, Matt cares a lot about science journalism, and he surely hated to see you saying that some theories you don’t know a thing about are already excluded. First of all, because it is too strong a statement, and second of all, [Edited by host: please stick to the science.] So you are literally undermining the natural development of science, by selling to the public statements that are not true, [Edited by host] and that belittle the work of thousands of people who are much smarter than you. But what can be done about such things happening…? Will still dont know how Prof. Strassler thinks about it, but maybe we can point out the worst misunderstandings promoted in respectable and powerful media here and Prof. Strassler would clean up the mess applying his cristal clear voice of reason …? Still I think, it would be very important to do it for science to keep things straight in the media. I’m sorry, I’m not going to fight Dr. Woit’s damaging misstatements. Not unless my colleagues are going to back me up in public, instead of just saying lots and lots of nice things in private. When an army sends out a single man to fight its battles, neither the man nor the army comes out in good shape. to proudly boast about it at Dr. Woits site afterwards. I`m very ashamed that such a thing happend here in Germany and about the fact that the organizers were obviously not able to stop him efficently but let him deliver his horrible monologue. From this aggressive attack it was cristal clear that Mr. Unzicker was neither interested in this particular public lecture nor in what Prof. Witten would have replayed if he had been able to get a word edgeway. Lest anyone misunderstand, I’m with Dude and Dilaton on this one…. This dude is not motl. I am confused by this claim. I can see, in a layman naive way, how say supersymmetry is theoretically supposed to predict a natural solution to the widely different energy scales seen. However, I don’t understand the “past experiments” part. Have we seen “partner” particles before? For example, do the electron and electron neutrino family classify as “partners”? (Likely not, since neutrino masses and so the energy scale isn’t predicted by the Standard Model, unless I am mistaken.) Or is it the 3 families that classify? But maybe he was alluding to the fact that additional not (yet?) seen partner particles are needed to explain why the higgs (and other bosons) which have been observed by now (past experiments) are that light compared to the Planck mass they should naturally have. “Past experiments” refers to (a) hadrons [the spin-zero particles of QCD satisfy this criterion, with lots of partner particles], and (b) various examples of such particles in the physics of solids. So no, this has never arisen in past experiments among the particles we now think of as fundamental (though of course we didn’t know the hadrons weren’t fundamental particles until the mid 50s.) None of the cases you mention are related to the issue I was referring to. If possible, I would like to know in a little more detail how it must be “natural” for spin-zero hadrons to have additional partner particles, and likewise for particles in the physics of solids. Is there any possibility that the spin of Higgs-like particle discovered in CERN is not zero in theoritical aspcect? If the spin of new particle is not zero, that particle can be explained by Standard Model? In principle it is possible, as far as the data is concerned. And if in fact its spin is not zero, then no, it cannot be explained by the Standard Model. 1) Your Blogosphere is a wonderful resource. Thank you for your generosity, patience, empathy, and knowledge. 2) Unlike most of your articles and following comment sections, this one and its comments all print (and convert to pdf) without a hitch. I posted once before on this issue and have continued to explore and experiment. Since this article works for printing purposes, I suspect that the ones that don’t, fail due to a flaw in construction, not by intention. In case other readers also like to print your articles–so as to highlight, make margin notes, etc., please consider having your badly behaved pages re-built so that they print properly. I don’t know why there would be any difference between past articles and present ones. I am using WordPress software that I only partly control, and I have not changed anything in the way that I construct pages, so I have no idea why this one would be different. I’ve tested the issue from two different computers, a Mac and a Windows 7 machine. Same behavior. I’d guess you could confirm it by trying to print or convert to pdf yourself. Your “Higgs FAQ 1.0” is an example of a misbehaving article (as are most that I’ve tried). The left half of the page gets cut off. Perhaps someone at WordPress can help. …a wonderful resource for students of both physics and sociology! Prof. Strassler: I can confirm what Richard Benish wrote about problems rendering the “Higgs FAQ 1.0” for print compared to this article. It appears to be a left margin issue; the text is cut off on the left. (I was using Chrome on Windows7.) This article renders fine. Might be a CSS problem; the WordPress folks might be able to help (when you have a moment).